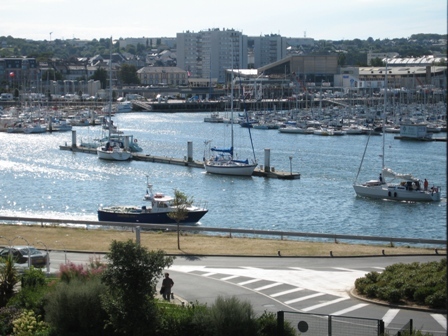 Cherbourg is the closest of all harbors to the ports of central southern England, and thereby a popular destination for the British. It was here in Cherbourg that the first scheduled transatlantic passenger service to New York began in 1869. 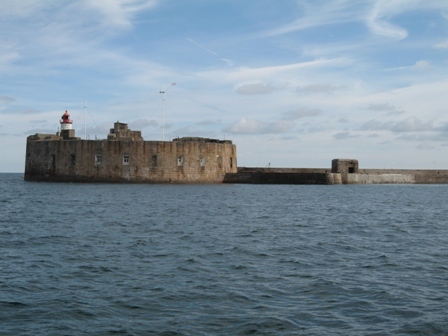 Cherbourg's harbor has massive fortifications that were conceived in Louis XVI's time and finally completed in 1853. 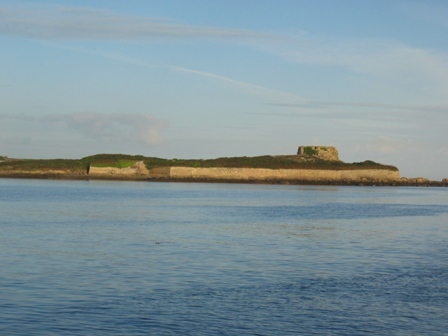 During the Nazi era the harbor was also built up as part of the Atlantic wall defenses. Throughout Normandy the landscape is littered with these concrete fortifications, a somber reminder of WWII. Here is Dalliance sitting on the pontoon with the city of Cherbourg in the background. 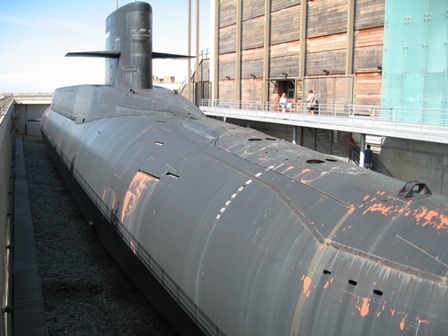 Cherbourg had a wonderful aquarium, La Cité de la Mer, which also contained France's first nuclear submarine, which is dry docked now and open to visitors. It was fascinating taking the tour through the sub. When it was operational it contained 16 nuclear war heads and if the time came to fire, not one but all 16 war heads would be fired off at once. 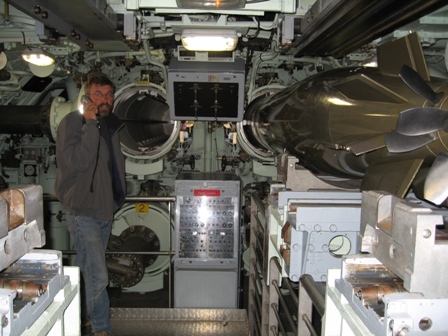 It was said that the intention was never to fire the missiles but they were to be used as a deterrent against attack. 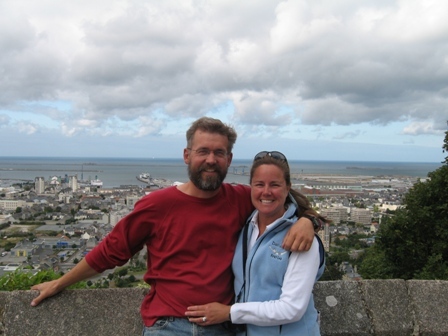 Marco and I have been getting in as much walking as possible and in Cherbourg we walked up to Fort du Roule, which housed the Musée de la Liberation, which recalled the events that lead to Cherbourg's liberation on June 27, 1944. It was also a great place to see the city from high up. 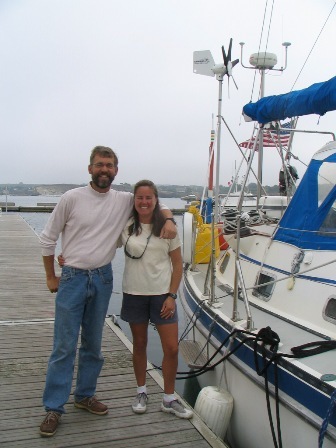 Marco and I have turned into fair weather sailors since the crossing and since we are in no great rush we tend to stay in a harbor until the winds and weather are favorable for a nice sail. 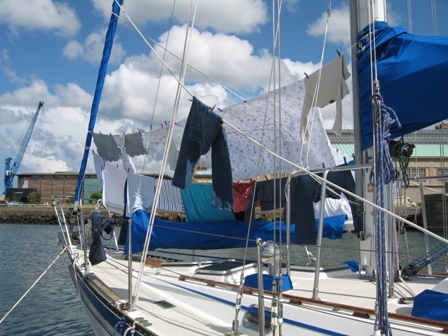 We ended up staying 6 days in Cherbourg, not one of the most salubrious ports so far, but we used the time for minor repairs and household chores. Our next harbor was Guernsey, UK. See Guernsey on the Adventure page for details. Almost immediately after leaving Guernsey, UK, I came down with a 24 hour stomach virus. My 4 hour watch at night consisted of sitting with a bowl on my lap and my head over the dodger while it rained. 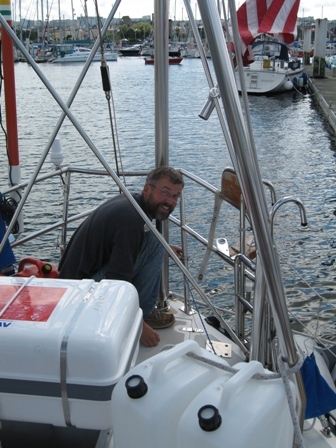 Marco however, had a wonderful watch where dolphins swan along side the boat creating a great deal of bioluminescence. 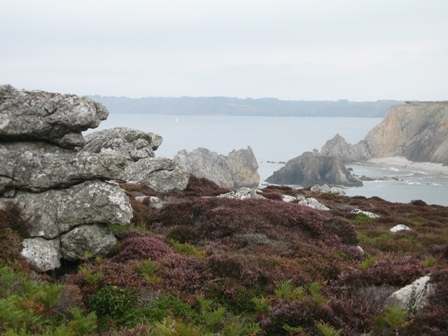 Once the sun came up in the morning, I was feeling much better, and the dramatic coast line of the Brittany Coast started to come into view. 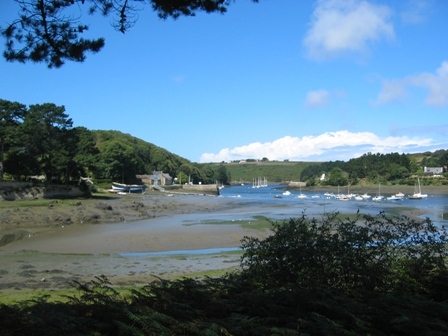 L' Aber Wrac'h is a beautiful little town and the river inland is filled with amazing nature. We both missed the small harbor setting and L' Aber Wrac'h was just what the doctor called for. Sailing into L' Aber Wrac'h and the outskirts of town. Even here in this peaceful setting there were fortifications remaining from WWII. 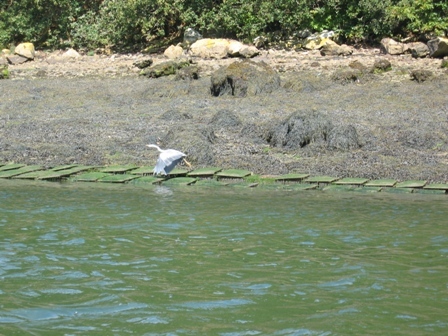 During low tide it was not uncommon to see the locals combing the rocks for muscles and oysters. 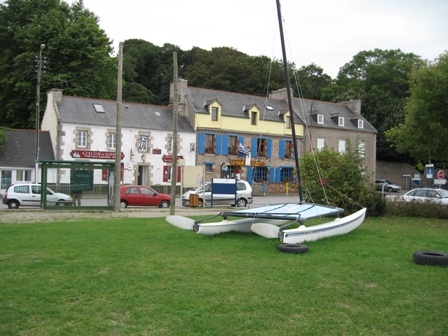 This is the main street in L' Aber Wrac'h. There was a beautiful gallery that displayed watercolors done around the area. We are far from our art acquisition stage, but Marco and I treated ourselves to a little water color painting of a lobster. We also had a wonderful French meal of fish soup (Poisson soupe), Cassoulette de St-Jacques (scallops baked in garlic, white wine, onions, crème fraîche with a bread crumb topping), white fish with a cream seafood sauce and sausage stuffed with apples. We will fondly remember French food!! Marco and I also took the dingy down the river where we saw herons, mussel farms, beautiful French cottages and lush, green farmland running along both sides of the river. 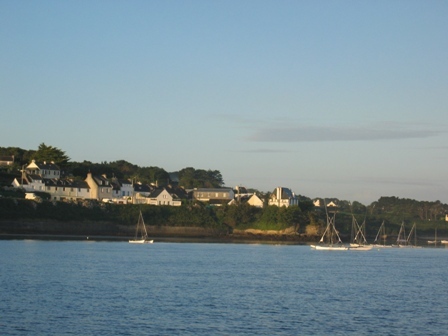 After having waited for a good weather window, we left L'Aber Wrac'h for Camaret through the Chenal du Four. 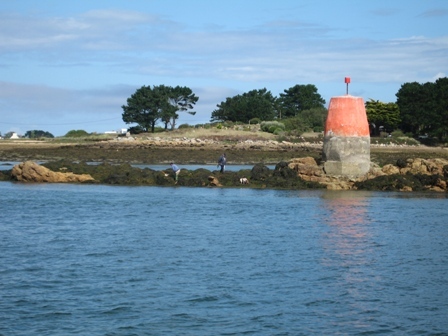 This is the inshore route for boats traveling along the Brittany prominence, and avoids the busy shipping lanes outside Ouessant. 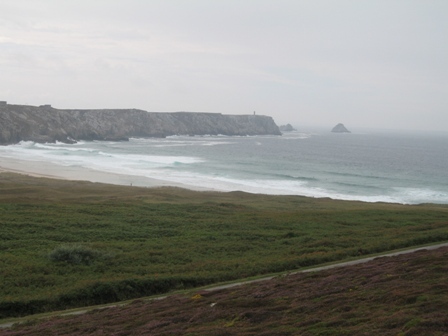 This area is also known for being exposed to the Atlantic swell, strong tidal streams, steep seas, and fog. With tidal currents running up to 9 knots at spring tides, the wind can produce enormous seas when opposing the tidal flow. It is remarkable how these infamous waters can change their character during good conditions. 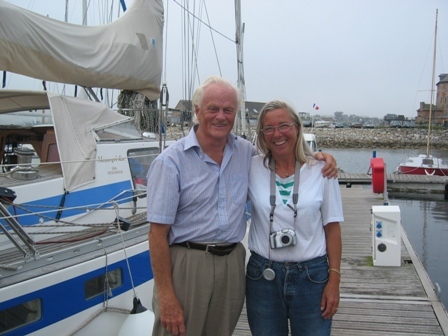 We left L'Aber Wrac'h on a fair tide and light following winds under sunny skies, and arrived 7 hours later in Camaret, where a kind Swedish couple caught our dock lines. Happy after another safe land fall in Camaret. 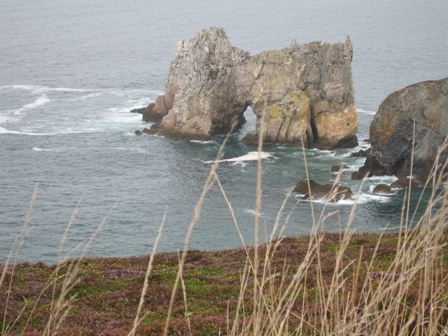 We spend an afternoon hiking around the seashore just outside of the Camaret harbor, and took in some spectacular sights. 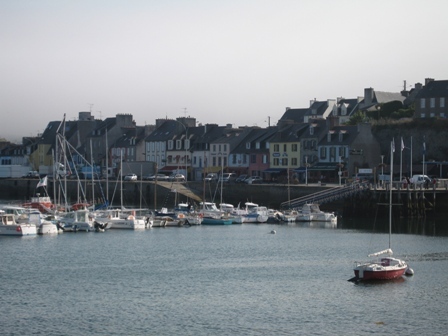 The marina in Camaret unfortunately did not have internet access, on which we have come to rely on for our email, web site, and detailed weather information. Luck was on our side, however, as the free Wi-Fi internet access was in an Irish pub, rather than the public library. 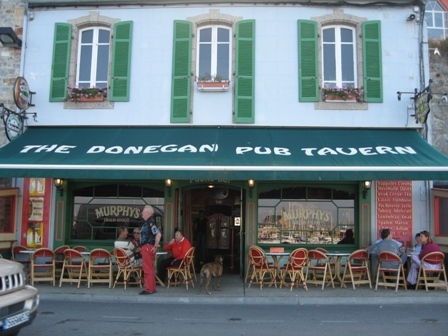 Having become a regular at Donegan's Pub, I (Marco) had a chance to meet some really great people from the UK. They stopped by Dalliance for coffee, before heading back home in light drizzly rain. Our neighbors at the marina arrived from Stockholm, Sweden in their beautiful self-built aluminum boat. They are planning to sail south to the Mediterranean. 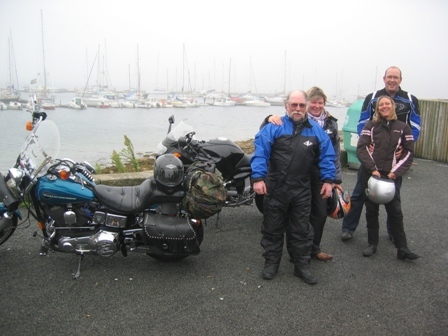 During our stay in Camaret, we have gotten to know Bruno and Eva, and had some great meals together, as well as discussions about the weather. When planning to cross the Bay of Biscay, these discussions take on greater significance.